It’s never easy to think about the possibility that you won’t be able to make your own decisions in the future. Preparing for the eventuality, completing a Power of Attorney early removes worry and stress at what could be a daunting time. A power of attorney is a legal document that allows someone to act on your behalf, or make decisions for you, if you’re no longer able to or if you no longer want to make your own decisions. It can be helpful for a temporary situation, e.g. a short hospital stay and need help with everyday things such as making sure bills are paid to longer-term plans, when losing mental capacity. Defined as the ability to make or communicate specific decisions at the time they need to be made. To have mental capacity you must understand the decision you need to make, why you need to make it, and the likely outcome of your decision. Some people will be able to make decisions about some things but not others. E.g. food choices but not financial decisions. This ability could change from day to day. Needing more time to understand or communicate doesn’t mean you lack mental capacity. For example, having dementia does not necessarily mean that someone is unable to make any decisions for themselves. Where someone is having difficulty communicating a decision, an attempt should always be made to overcome those difficulties and help the person decide for themselves. However, if there does come a time when you’re unable to make your own decisions, you will have lost mental capacity and someone else may need to make decisions for you. These could be financial, health or medical care decisions. Ordinary Power of Attorney covers decisions about your financial affairs and is valid while you have mental capacity. It is suitable if you need cover for a temporary period (hospital stay or holiday) or if you find it hard to get outside, or you want someone to act for you. Lasting Power of Attorney covers decisions about your financial affairs, or your health and care. It comes into effect if you lose mental capacity, or if you no longer want to make decisions for yourself. You would set up an LPA if you want to make sure you’re covered in the future. If you’re considering naming someone as your POA, it might be helpful to have a conversation with the person. Discuss the duties and responsibilities of the position, along with the scope of your financial and legal affairs. This may help to determine if the person you’re considering to be your POA is the right person for the job. A POA should be someone you trust, who you believe understands your values, and will do their best to act in your best financial and legal interests. They require an understanding of their duties, and a commitment to taking those duties seriously. An understanding of finances and the ability to collaborate with attorneys, accountants, and other parties, if necessary. You are in effect giving the POA a ‘pin code’ to your finances. Most people choose their husband, wife, partner, another family member, solicitor or a close friend. Your attorney could also be a company. You might want to choose more than one attorney. If you do, you can say whether they need to make decisions jointly (a good idea if you want two opinions on your finances) or whether each can decide things without the other (good for spreading the load). You should also choose at least one replacement attorney who would take over if your attorney died or could no longer act for you. If you are older and the people you choose are all the same age as you too, they might not end up being the best people to act for you if and when you need their help. For an Ordinary Power of Attorney: Contact your local Citizen’s Advice or get advice from a solicitor as there is a standard form of wording that must be used. Step 2: Fill out the relevant forms in Step 1, you can download or request a hard copy of the forms. 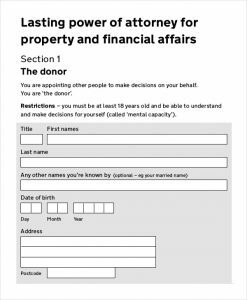 You can fill out the forms yourself, or if you would prefer a solicitor or local advice agency can help you. Step 3: Get your LPA signed by a certificate provider. This is someone who confirms that you understand it and haven’t been put under any pressure to sign it. The certificate provider must be someone you know well or a professional person such as a doctor, social worker or solicitor. Step 4: Register your LPA with the Office of the Public Guardian. This must be done before it can be used. There is a fee to register your LPA, which the Office of the Public Guardian can tell you about. You must register your LPA while you still have mental capacity and it can’t be used during the registration process which takes about nine weeks. If you lose mental capacity but signed the LPA while you still had mental capacity, your attorney can register it for you. Please Note – If you’re married or in a civil partnership, you assumed that your spouse would automatically be your POA? This is not the case. If you lose the ability to do so, your spouse cannot deal with your bank account. Neither can they deal with your pensions or make decisions about your healthcare. Without an LPA, they won’t have the authority. You don’t have to use a solicitor to create an LPA. The application forms from the Office of the Public Guardian (OPG) contain guidance to help you fill them out. You can fill them in online and phone the OPG helpline if you have any issues or concerns. If there are mistakes, you may have to start the process again or apply again within 3 months at extra cost. Please Note – We recommend that you seek professional legal advice to understand the various options and implications. How can Investing Ethically Ltd help? As clients of Investing Ethically Ltd, we will record your LPA details upon sight of the original copy document. If it becomes effective we can forward the Lasting Power of Attorney document to your investment providers. We will act on instructions from your attorney, advising them as we would yourself. If you have any further queries regarding Power of Attorneys, please do not hesitate to approach us.